It's Wednesday and I did not attend the regular Twilight tour at Amityville this time because I plan to join the Moonlight tour this coming Saturday evening instead. Although this entry is a few days later, I must write about this past Sunday outing. My Ex-wife's cousin (my cousin-inlaw?) Juliano joined me for a morning outing around the Nissequogue entrance and Long Island Sound. We paddled at a rather moderate pace as we enjoyed the view. It was the day after a serious thunderstorm and there was no trace of it. Fairly the opposite story was told the day after the storm as we set out to a clear, sunny day. The wind blew just right and the low tide was not noticeable by any scent. In fact, the tide was lower than I have ever seen here! For this reason, we were able to explore for some jewels hidden at the bottom of the nissequogue. Our exploration came to an abrupt shock when we found ourselves at an island built up by nothing but millions of oysters. (see photo below). Sure there were clams, muscles, and stackers around but only a few here and there. This place was bedded by so many oysters that there was barely any sand. Those are not rocks! 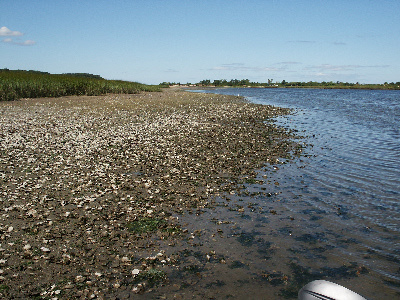 If not for the fact that the water is only brackish and the area is not safe for shellfish, I would have broke out my knife and started chucking them there. As we set out of the Nissequogue, we headed to the Long Island Sound by departing the mouth of the Nissequogue past Short Beach and onward Northbound. The sound slowly changed, from calm to slightly vibrant, with 2 foot swells that rolled in smoothly. We continued north to a point where we thought "Let's go to Connecticut!" but by this time it was past 12:30pm and my stomach nudged me to head back as I was starving for lunch. Honestly, we would not take this route to Connecticut seriously unless we planned and prepared ahead of time but it did cross our mind. One stupid thing did take place... I did not wear my PFD. I intentionally did not do it in the Nissequogue because the water was barely knee deep but that all changed when we hit the sound. Unfortunately, the buoys we past and marked do not appear in any map, but I was able to triangulate our approximate location by some landmarks. And according to the maps, the bed was 45 feet under us. Rather Deep without a PFD! Next time, I will take a map with me and, of course, I'll wear the PFD. Hey... you never know what to expect. On a side note: I finally took out an old digital camera with me this time. It isn't waterproof but it isn't an important camera either as we retired it for new models.